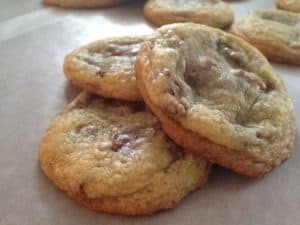 November 7, 2014 0 comments on "Milky Way Cookies"
I am always looking for new cookie recipes. This Milky Way cookie is basically a chocolate chip cookie dough with chopped up Milky Way bars mixed into the dough instead of chocolate chips. They are really good! Preheat oven to 350 degrees. Chop up the Milky Way bars into small pieces. Mix together butter and sugars until creamy. Beat in eggs and vanilla extract. In a separate bowl, combine flour, baking soda, and salt. Add flour mixture to the butter mixture. Stir in the chopped Milky Way bars. Form the cookies into small balls and place on lined cookie sheet. I found that the smaller the cookies the better they turned out, they don’t spread as much. My balls were about 1 inch across. Bake for about 8 to 10 minutes, and then let the cookies set on the cookie sheet for a minute or two before transferring them to a wire rack to cool completely. Follow my Favorite Recipes and Christmas boards on Pinterest.